This course is a great introduction to making pottery forms without the potter’s wheel. 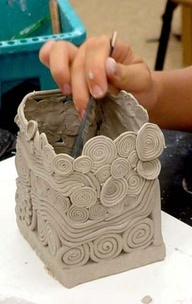 Participants will make a cup, a bowl, a plate and a vase using clay molds and coil building techniques. These techniques can be used anywhere without the need for expensive tools. All finished pieces will be glazed with food safe glazes and suitable for the dishwasher and microwave. Introduction to Handbuilding Pottery is part of Vuka's 6-week summer class program. Class will be held over the following 6 Mondays from 6:30pm - 8:00pm at Vuka. Ryan started making pots while he was an art student at Abilene University in West Texas. After receiving his BFA he moved to Austin in 1995 and began an apprenticeship with Billy Ray Mangham. As his apprenticeship continued he developed my own style, taught children and adults and began building his own kilns. Today he divides his time between his own studio, the ceramic studio tech duties at the Dougherty Arts Center, organizing the Art of the Pot Studio Tour and teaching and exhibiting around the country. Vuka Austin thank you for this informative post on Handbuilding Pottery. Love your beautiful art work and the vikingcaulking pieces as well. This course seem worth taking, it could be of great help though, keep sharing. Hand building permits you a great choice to get away from average forms which are thrown. The Penland Ceramics book, which can try out here Paper Writing Help at Top paper service... has an amazing variety of numerous handbuilt projects. Ideally, it should be in your school or city public library. Introduction to Handbuilding Pottery is the best article which guides you better. The campingsaw levelbee also guide us. I hope you get the proper guide. An introduction of the hand building is done for the suspected terms for the humans. The nomination of the strength and best assignment writing service uk is provided for the flow of the terms for the humans in life. Please park in our lot or on the street - just keep an eye out for residential parking signs.